When I first saw the code word for CASology my first thought was a landmark birthday and there just happens to be one coming up for the janitor in my old work so decided to make a card for him on his retirement there is no bigger landmark than that! I stamped the beach image from a wooden cube stamp that I have and I had this deckchair image too so decided to add the two together as Alan and his wife love nothing better then jetting off into the sun! and are looking forward to more holidays in the future. Thank you for taking the time to look ! What a perfect retirement card, Jenni! 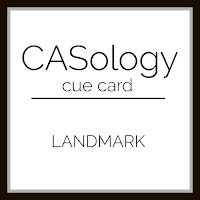 Thanks for playing along with us at CASology this week! Now this is one fabulous landmark....love your card. Wonderful landmark for retirement! Just the right place. So happy you could play in the CASology challenge this week.